It’s surprising, and disturbing, that the UK Prime Minister, David Cameron, and the Scottish First Minister, Alex Salmond, should have signed an agreement on the Scottish independence referendum to be held in autumn 2014 in which there will be only one question – probably on the lines of “Do you wish Scotland to remain in the United Kingdom, yes or no?” – and under which children of 16 and 17 will be eligible to vote. The first and minor surprise is that Cameron should have agreed to give the vote at the referendum to children. Common sense suggests that teenagers are much likelier to vote for the radical option of independence than most older voters; so he has given the SNP and the independistas a head start, while apparently getting nothing in return. He has also set a most dangerous precedent for other future elections, not just in Scotland. If votes for children are OK in a referendum to settle the future of the United Kingdom, why should they not be OK in future UK general elections, local elections, referendums on Britain’s future in the EU, and the rest? If children of 16 are to be trusted to vote, why not 15- or 14-year-olds? This is the worst kind of pandering to the sentimental idealisation of the young. The second and much more worrying surprise is that either Cameron or Salmond should have agreed to a single-question referendum. Until recently, Salmond was speculating about the possibility of a third question, implying three options: independence, the status quo, or “devo max” (i.e. further maximum devolution of powers to Scotland, amounting to full internal self-government). The evidence of recent polls is that a clear majority of Scots would prefer devo max to either independence or the status quo, and it looked at one time as if Salmond and the SNP were preparing if necessary to accept a referendum vote for devo max as the next best thing to independence and a possible stepping stone to it. Conversely, a more cautious British leader than Cameron would surely have taken the view that Scots faced with a straight choice between independence and the status quo, when most of them apparently want devo max, might well feel themselves forced to vote for independence, and that an offer of devo max (as a further alternative to the status quo option) would be the best way to minimise the number of votes for independence. Please feel free to comment on this blog post, whether applauding, denouncing or correcting it — but please append your comments at the foot of the original article at http://www.barder.com/3804, not by private email. For example please don’t send your comments in reply to the email you may have received notifying you of a new blog post with the full text (but probably no illustrations or comments by others), unless what you want to say is purely personal. Thanks, and now read on. Thus it’s difficult to understand why Cameron should have insisted on a single ‘yes or no’ answer to the question whether Scotland should remain in the United Kingdom. It is equally difficult to understand why Alex Salmond should have dropped the idea of a compromise option of devo max, given that this seems to be what most Scots want. The agreement of 15 October paradoxically entails a grave risk for each side. The risk for Cameron is that a majority of Scots, deprived of the option of voting for devo max as they would like to do, will vote instead for independence, frustrated and exasperated at being denied the option of voting for what they actually want. The risk for Salmond and the SNP is that by the time of the referendum in the autumn of 2014, there will still be no majority appetite for independence, enthusiasm for which has been ebbing in recent months, and that accordingly there will be a clear majority for the only alternative on offer, namely the status quo, which would inevitably (and quite reasonably) be interpreted as a decisive rejection of independence. Part of the answer may lie in internal Conservative party politics. A substantial number of Tories both in Parliament and in the country, already sceptical about the limited devolution to Scotland, Wales and Northern Ireland so far granted, are said to be strongly opposed to the devolution of yet more powers to Scotland. A more farsighted objection in some minds is that devo max, amounting to full internal self-government for Scotland, would prompt irresistible demands by England for the same status, remedying the absurd and unsustainable situation in which England, alone of the four UK nations, currently enjoys no devolution at all. With Wales and Northern Ireland, both already extensively devolved, likely to follow suit, full internal self-government for each of the four UK nations would make the United Kingdom a full-blown federation, which is clearly the logical (and highly desirable) culmination of the devolution process. No wonder that Westminster politicians, flattering themselves with the long exploded myth of parliamentary sovereignty in which the powers of the government and legislature at London are represented as both unlimited and constitutionally incapable of being limited, view with horror the idea that the vast majority of the subjects with which they deal from day to day would be transferred to the parliaments and governments of the four nations, leaving them with responsibility for little more than foreign affairs, defence, and any other matters which are necessarily dealt with on an all-UK basis. [After concluding the agreement with Salmond] Cameron said that if people in Scotland wanted further devolution, they should reject independence. Cameron said that if Scotland voted to stay in the UK, further devolution would be possible. Cameron’s warning to the Scots that if they vote for independence, “it’s the end of devolution” is a meaningless threat, indeed a statement of the painfully obvious. What is more significant is his reported promise that if Scotland votes to stay in the UK, “further devolution would be possible”. This however seems to imply that the London government will be prepared to discuss what kind of further devolution will be available to Scotland only after the Scots have rejected independence in a referendum that’s still two years off. Such a sequence will surely be untenable. To ask the Scots to vote against independence and in favour of an alternative involving an undefined measure of further devolution is to ask them to buy a pig in a poke. Salmond and the SNP will certainly be forced to spell out in much greater detail than they have done so far what exactly would be involved in independence. Already Salmond has been caught out equivocating, almost to the point of mendacity, about whether an independent Scotland would automatically remain part of the EU, or whether she would have to join the queue of applicants as a new candidate for membership. Similar questions will arise over Scottish membership of the UN and many other international bodies. There will be countless other thorny matters in connection with possible independence demanding answers between now and the referendum. But by the same token there will be questions to be answered about what exactly is meant by the ‘further devolution’ dangled by Cameron in front of Scottish voters as a reward for rejecting independence. It is time for some hard work to be done by both sides on the answers to all these questions, in plenty of time for the referendum. Scottish voters are entitled to those answers before they vote, not afterwards when it will be too late. It seems therefore that both Cameron and Salmond have each agreed on a huge gamble: Cameron betting that the Scots, deprived of the option of devo max which most of them actually want, but reassured by a vague promise of ‘further devolution’ if they vote against independence, will vote accordingly; Salmond gambling that without a specific offer of devo max, plainly defined, a majority will go for independence as the nearest thing to it. Both sides have a lot to lose if their gambles fail. If Cameron has guessed wrong, Scotland will vote for independence and the United Kingdom will disintegrate; Cameron will then go down in history as the prime minister who presided over the dissolution of his country. Conversely, if Salmond has guessed wrong, Scotland will say a flat No to independence, with little prospect of another bite at the independence cherry for a generation, and not even a bankable guarantee of further significant devolution. Not only are both men gamblers: they are reckless and irresponsible gamblers who have lost sight of the best interests of both Scotland and the United Kingdom, which plainly lie in a commitment to the offer of further full devolution and all that will follow from it. The best hope now must be that Labour and the Lib Dems will refuse to follow Cameron down his reckless path, and instead will work together, ideally in consultation with the SNP and the other nationalist parties, on elaborating a programme of full devolution, amounting to full internal self-government, for Scotland if the Scots vote No to independence in 2014. This programme would form a commitment by a future Labour government, with or without Lib Dems support, spelled out in as much detail as possible well before the Scottish referendum. If it remains the case that when they come to vote in 2014 the majority of Scots will still prefer devo max to either independence or the status quo, a detailed promise by Labour and the Lib Dems of full devolution in the event of a rejection of independence would effectively give the Scottish voters what Cameron and Salmond have conspired to withhold from them: the opportunity to vote in the referendum for what most Scots want. Do the Labour and Lib Dem leaderships have the foresight and guts to do what needs to be done, not just for Scotland but for the future of Britain? Don’t bet on it. I fully agree with you. In particular I am irritated by the enabling of sixteen- and seventeen-year-olds as voters in this particular case but not in a Parliamentary election. Voting, like getting married, making a will, serving on a jury, volunteering for the Forces (or being conscripted) is one of the rites of passage experienced as one grows up and there is no reason whatever why these privileges should all be achieved at the same age. Also irritating is the decision to hold the election in the year of the seven-hundredth anniversary of Bannockburn, a blatant attempt to appeal to ‘Braveheart’ emotions (I didn’t see the film, but understand it to have been full of historical howlers and errors in period detail. But I digress!). As regards the EEC: could it be possible that the rump of the UK following the secession of Scotland will be regarded as essentially a new country and therefore will also required to re-negotiate membership if Scotland is? From across the Channel England and Scotland must be regarded as essentially equal partners both in the Union of the Crowns and (despite the complaints of Nationalists) the Union of the Parliaments. Tim, thanks for your comment. On ‘votes for children’, I agree that there’s no logical requirement for uniformity in the qualifying ages for the various rights and obligations — voting in different kinds of election, joining the armed forces, liability to be sent into action in war, being sent to an adult prison, making a will, being elected to the house of commons or the house of lords, and so forth. For every one of these, any age requirement is bound to be arbitrary: some, perhaps many, 17-year-olds are better informed and are better equipped to make sensible judgements than many adults of all ages. But a line has to be drawn somewhere and 18 seems broadly right. We value the concept of (almost) universal adult suffrage and there are obvious objections to making the vote subject to qualifications such as IQ tests, possession of property or ability to recognise the faces or policies of competing candidates. Equally, there are obvious objections to giving the vote to children at or below the age of 15 — obvious to me, anyway! — and the same objections apply almost equally to children aged 16 and 17. Some would even argue that the voting age should revert to 21. In the case of the Scottish referendum, the argument is corrupted by unconcealable calculations of likely consequences. It’s obvious why Alex Salmond wants 16- and 17-year-olds to have the vote. The mystery is why a Conservative Unionist UK prime minister should agree with him. On the timing of the referendum, no doubt the anniversary of Bannockburn and accompanying flare-up of ‘Braveheart’ Scottish patriotism have a lot to do with it, as you say. I suspect that the Commonwealth Games, taking place in Glasgow just a few weeks before the referendum is due — 23 July to 3 August 2014 — and with Scottish athletes competing under the Scottish flag (as distinct from being co-opted into the crudely mis-named ‘Team GB’) also has a good deal to do with it. But this is to be a Scottish referendum, made in Scotland, and there has always been a strong case for not rushing into it (as Cameron and the Tories were demanding until recently) before the ramifications of the two or more options have been fully worked out and debated. Of course Salmond’s main reason for delaying the vote to 2014 must be that he needs time for the independence option, currently supported by only a minority of Scots, to gather more support. Your suggestion that if Scotland secedes from the rest of the UK, both Scotland and RUK (the rest of the UK) might be regarded as new states which will both have to join the queue of candidates applying to join the EU (and presumably the UN and other international bodies) has been raised before, but I think it lacks credibility. Even including Scotland in the UK, England, Wales and Northern Ireland amount to well over 80 per cent of the population, and the subtraction of Scotland, although it would be deeply traumatic, wouldn’t change the basic legal character or international identity of the country. The precedent of the dissolution of the Soviet Union is surely relevant: a massive proportion of the USSR became independent as new separate republics, yet there was never AFAIK any doubt about Russia (the equivalent of RUK) automatically inheriting the former Soviet seat in the UN, including permanent membership of the Security Council. The argument about Scotland and EU membership is much less clear-cut. It looks as if Salmond’s failure, now revealed, to take legal advice on the subject may most plausibly be explained by his fear that it would produce the wrong answer from his point of view. Brian I will make a considered comment in due course but meantime you might like to look at the Scottish Lib Dems’ proposals for Home Rule produced under Ming Campbell’s chairmanship which go a long way towards a federal structure for the UK. They are available on the Scottish party’s website. Brian writes: Many thanks for this. I am delighted that you have pointed me, and I hope others, in the direction of the Scottish LibDems policy document on “Federalism: the best future for Scotland”, including detailed proposals for home rule for Scotland (a better formulation than ‘devo max’, incidentally). I urge all visitors to Ephems to read this admirable and realistic document, at http://scotlibdems.org.uk/files/Home%20Rule%20Commission%20-%20Federalism%20-%20the%20best%20future%20for%20Scotland.pdf(a PDF file). If only the Labour party, at both UK and Scottish levels, would sign up to this progressive and enlightened policy, the way would be open for long overdue reform of our now hopelessly muddled constitution, and we would have a genuine and extremely attractive alternative to full independence to offer the Scottish people in 2014! Alas, as long as it remains gathering dust in the archives of the Scottish LibDems, without much broader support, its benign influence on events seems doomed to remain at zero. Richard, I await your promised further comments with great interest. I agree with your views here – both men are, in their separate ways, reckless and irresponsible. The answer regrading EU membership is not crystal clear. There are assertions one way or another but few clear answers. Given the economic importance of this, one might have thought that the voter would need to have clarity prior to voting. It should be the duty of the advocate of independence (i.e. Salmond) to provide that clarity to the voter. Now that the Edinburgh agreement has been signed, there should be no good reason why any legal advice obtained either in London or Edinburgh should not be published. Vis a vis a federal solution. I have always agreed that it has merit but would only work with the EU if links to the EU were via Brussels. A final question always is – just what exactly is meant by independence. Does it mean no further money from England / Wales/ NI or does it mean independence but with continuing strings for E W NI ? I read and largely agreed with your blog on the independence referendum. Why is it that the option that appears to be the most popular is the one that is excluded from the ballot paper? This would be one occasion where AV might actually be useful! It also strikes me as being remarkably perverse to tell people that if they vote “no” the government will consider giving greater powers to the Scottish Parliament. What are people who want to maintain the status quo supposed to do? Put two crosses in the “no” box? Meanwhile, I am not overly impressed by Labour’s contribution to date. It has been wholly [I did write “almost wholly” but couldn’t think of anything positive they have said] negative and driven more by a hatred of the SNP, and often takes the form of personal attacks. It also seems to be influencing Labour’s views on the replacement of Trident. Ye Gods. What is the Labour party for? Brian writes: Thank you for this. I wish the Labour Party leadership would read the Scottish LibDem document strongly commended in the comment at http://www.barder.com/3804/comment-page-1#comment-156932 and my response to it, and recognise its contents as a route map that Labour should enthusiastically adopt. I am appalled at the idea of allowing 16-year-olds to vote in the referendum. It is gerrymandering. At 17 I was old enough to enlist in the South African Air Force as a pilot, but, rightly, had no vote till I was 21. With the way history is now taught, 16-year-old Scots’ view of their history will probably be based on the film “Braveheart“! I fought for King and Empire and Great Britain. The thought that Britain may be broken up at the will of a self-serving, jumped-up Scot is quite awful. Is Cameron a Scot? the name certainly is! Brian writes: Thank you for this. It’s refreshing to have a view from your special perspective and I very much sympathise with it. As to whether David Cameron, with his Scottish name, is himself a Scot, the facts according to Wikipedia are that he was born on 9 October 1966, the younger son of stockbroker Ian Donald Cameron (1932 – 2010) and his wife Mary Fleur (née Mount, born 1934, a retired Justice of the Peace, daughter of Sir William Mount, 2nd Baronet). Cameron’s parents were married on 20 October 1962. He was born in London, and brought up in Peasemore, Berkshire. His father was born at Blairmore House, a country house near Huntly, Aberdeenshire, and died near Toulon in France on 8 September 2010. Blairmore was built by his great-great-grandfather, Alexander Geddes, who had made a fortune in the grain trade in Chicago, and returned to Scotland in the 1880s. Many commentators have remarked that Cameron admires and models himself on Tony Blair (surprising as that might seem at first glance), so it’s rather appropriate that his ancestral home should be called Blairmore House. I’m mortified to learn that I’m the same age as David Cameron’s mother and only two years younger than his father would have been. Let me get the relatively small but potentially important point about the voting age out of the way first. Like you, I am uneasy about extending the age down to 16 and like you 18 seems a comfortable point. The unease is heightened by the motivation of the SNP Government in pushing for it since it is hardly a matter of doubt that they see political advantage in the change. I do however, contrariwise, have some sympathy with the point that 16 years olds can marry, be enlisted in the army and therefore be killed in service and can set up their own households so since the point is conceded, I would go along with the flow and extend the franchise to all voting and not just the referendum. The difficulty may come in the practicality of getting the new voters registered in time which may give Salmond an opportunity to postpone the referendum if he thinks he is going to lose it. The wider point is whether there should be a triple choice in the referendum. Can I take you back about a year when Willie Rennie (Scottish Lib Dem leader) asked a Parliamentary question of Alex Salmond to the effect of how he might regard two majority votes where there was a strong vote in favour of what was then devo-max as I recall and a smaller vote for independence. His answer was unequivocally that he would regard that as a mandate for independence. This was at a time when the final shape of the voting had not been cleared and in particular whether any form of preferential voting might be allowed and Salmond was playing all sorts of games about the Electoral Commission’s role. This in my view hardened the resolve of the unionist parties to keep the voting confined to the issue of independence or not. My own view is that the matter is best kept to a simple choice because it removes all doubt about the outcome. There was and is a measure of politics here because as things stand presently, the enthusiasm for independence is waning. I would almost say daily with the Scottish Government’s increasing centralising tendencies, its high-handedness and the tendency to equate opposition to its plans and policies as unpatriotic and unscottish. There is an increasing whiff of Fianna Fail about the SNP, although I must in fairness say that Labour have the corruption racket pretty well sewn up in the Central Belt. The tendency to see dissent as unpatriotic was exemplified by the reaction to a discussion paper put forward by Tavish Scott and Liam McArthur, the MSPs for Shetland and Orkney respectively which sought to open up the treatment the Northern Isles might get in an independent Scotland and how things might be done to the advantage of the Isles. I am surprised that the shrieks of disloyalty were not heard in London. The Scottish Lib Dems have produced a good and well thought through set of proposals for what amounts to Home Rule in a potentially federal UK. It goes further into decentralising power within Scotland. I think it the first since as far as I know, neither the SNP nor the other unionist parties have put anything forward other than the SNP’s moonshine about the currency, defence contracts, NATO status and EU membership all of which are vague and undefined and which depend almost completely on goodwill on the part of the remainder of the UK towards an independent Scotland. Salmond seems to have swallowed Asquith’s wait and see whole. On the basis of Cameron’s commitment and clear Lib Dem policy ideas, Labour are going to struggle to avoid a commensurate approach. If the UK Lib Dems have any sense they will get talking to Labour soon although I note that labour are talking of a constitutional commission – I think Lord Foulkes was mentioned as a member. On a related matter, I have a nagging concern about the impact and the timing of the prospective referendum on the UK’s status in the EU. Scots are generally less Europhobic and might be more prone to vote for the status quo. If a vote takes place after the Scottish referendum and there has been a yes vote for independence, presumably the Scottish electorate will not take part; if on the other hand the vote takes place after Scotland has voted to stay in the union but the outturn in the north is in favour of EU membership and no repatriation of powers, will this give Salmond the key to re-open the independence debate? For me Scottish home rule in a federal state is the way forward. If taken forward, it will give the other constituent parts of the UK comparable and equivalent treatment and a stable and balanced constitutional framework which may satisfy some of the Tory MPs. *NB: if the majority of votes are Yes to Q1, the votes in answer to Q2 will not be counted. The whole question of a referendum on Britain’s future relationship with the EU should really be the subject of a new and separate post, since it’s not directly relevant to this post about the Scottish independence referendum. Personally, I believe and hope that no present or future British government would be mad enough to hold a referendum on whether the UK (with or without Scotland) should leave the EU when (a) there’s a serious risk of a majority vote for doing so, given the scale and intensity of current anti-EU sentiment in the country, with predictably catastrophic consequences for our country; and (b) the EU is and will for some time remain in a state of flux while the Eurozone members decide for or against tight integration of the Eurozone states. The implications for Britain of that choice by the Euro countries will be enormous, and it would be insane to make an irrevocable decision on Britain’s membership of the EU while it’s impossible to predict what will happen in the Eurozone. No doubt there will eventually have to be some kind of referendum on the EU and Britain, but I’ll be amazed and horrified if it’s on an “in-or-out” question, however loudly UKIP and the Tory Europhobes might bay for one. However, this is not the place to pursue these matters, interesting and important though they are. In today’s Guardian, there is a press release from Carwyn Jones which seems to be making much the same point as I intended that a referendum on the EU would be de-stabilising in the ‘non-England’ parts of the UK where an English majority votes to leave against the wishes of Wales and Scotland and probably Northern Ireland. He points out the irony that those pressing for a vote on the grounds of the commitemnt to the UK may actually be imperilling the very future of the UK they wish to protect. I agree with you that a vote for 16/17 year olds is ridiculous — but I doubt if anyone has any idea what difference, if any, this idiocy will make to the outcome. I’m afraid I don’t agree with you on the 2 versus 3 question dispute for the referendum. You can’t have a question about devo-max in a situation where no-one knows what it means, or where everyone puts their own interpretation on the phrase. (It’s hard enough to talk about “independence”, which is already an ambiguous term.) Clarifying the meaning of devo-max would involve lengthy and acrimonious negotiations which could well go unresolved for years. It is bad enough (and illogical enough) that a yes/no vote on Scottish “independence” which carries large implications for England, Wales, and NI, should be decided solely by the votes of Scottish residents (regardless of nationality). It would be much worse that a vote for devo-max, which must, however defined, have even graver implications for other UK citizens, should be so decided. Quite apart from whether such a question, even using your formula, could be adequately understood by voters. It is practically a convention by now that referenda are only conducted on the basis of a single yes/no question – and a good thing too. Anyway, I think you are over-anxious, and therefore over-dramatic, about the short-term situation. There has never in 20/21st century history been a majority for Scottish separatism, if pollsters are even approximately to be trusted. Present indications are that the gap is widening, and the more voters are obliged to recognise and consider the questions that a vote for “independence” would leave open (the EU, the currency, the BBC, the NHS, the drawing of boundaries in the North Sea, etc., etc., etc.) as they will increasingly be as the date draws nearer, the more they will incline to the status quo. Moreover Salmond is in an amusing lose/lose situation. If Scotland is perceived in 2015 to be, absolutely or relative to the UK, doing well, then clearly the status quo is satisfactory; if badly, then this must be the fault of the SNP government. I do agree, though, that the status quo is itself not maintainable. The big struggle, once we have kicked independence into the very long grass, will be to convince Whitehall and Westminster that what is required is not just some further tinkering with levels of devolution for Scotland (followed by moans of unequal treatment from Wales and NI and Cornwall and Yorkshire} but a long-term consideration of some kind of federal solution. What a wonderful relief if the Labour Party would announce now that after 2015 there will be a serious effort to examine and re-negotiate the relationships between the three, or four, (or five or six) members of the UK. But I don’t suppose anyone should hold their breath. Brian writes: Many thanks for this, Robin. As you raise a number of key points, almost all demanding a reply or at least a gloss, I am responding in a separate comment. Thanks, Robin, for your stimulating comment (http://www.barder.com/3804/comment-page-1#comment-158124). You raise a number of important and pregnant points. On the voting age for the Scottish independence referendum, there’s a fairly broad consensus that a higher proportion of 16- and 17-year-olds will vote for independence than in other age groups, and a much higher proportion than the over-50s. This is consistent with the polls and with common sense and I see no reason for scepticism about it. Of course, there’s no definite decision yet on enfranchising these children; all that has happened so far is that Cameron has agreed that the question may be decided unilaterally by the Scottish government. But Salmond is on record as favouring it — for, I continue to assert, obvious reasons. I hope I have never advocated requiring Scottish voters to vote for or against devo max (or home rule or full internal self-government) without first spelling out in some detail what it would entail: indeed, I have repeatedly urged the absolute necessity of the two governments and all the political parties involved negotiating and publishing the detailed implications of both (or all) the options, including independence, indicating wherever appropriate areas of disagreement that would need to be resolved if that option were to gain the most votes. In fact an excellent analysis with detailed recommendations regarding home rule for Scotland already exists — please see my response to a comment at http://www.barder.com/3804/comment-page-1#comment-156932 and the PDF document itself (here). In a sane world, that document would form the basis for inter-party consultations leading to general agreement on what would happen if home rule were to be an option in the referendum and if that option emerged as the preference of the majority — identifying those questions that would have to be settled later. The UK electorate has shown itself well able to understand the meaning of the 3-question formula I have suggested and how to vote accordingly, by coping easily with much more complex voting systems, e.g. for elections to the European parliament and in elections to the devolved parliaments. Australian voters happily manage far more complicated systems still in the numerous elections that they are required by law to vote in and I doubt if the Scots are materially stupider than the Aussies. Indeed, the Scots and the Aussies must both come close to the top of the IQ league tables. Anyway, there are several other ways of achieving the same purpose: disposing first of the question of independence (yes or no), and only if the Noes have it on independence, asking the Scots to choose between home rule (full devolution, internal self-government) and the status quo. It can be done by single transferable vote or some variant of it, in which the voter ranks the three options in order of preference, and at the count the option receiving the fewest votes is eliminated and its second preferences redistributed. Such systems are used all over the world, including throughout the UK in various elections, and there seems no reason to suspect that it would be beyond the wit of Scottish voters. 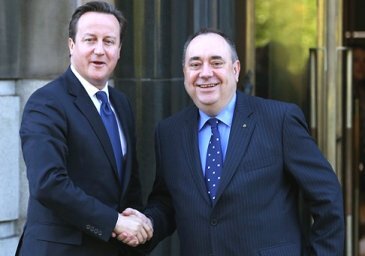 Cameron’s insistence on a simple yes or no to independence with no option for home rule thus amounts to a wild and unnecessary gamble, and Salmond’s agreement to it likewise. It’s true, as you say, that whatever the Scottish voters decide in autumn 2014 will (or may) have profound consequences for the rest of the UK, and in particular for Scots living outside Scotland and not registered to vote in Scotland: so there’s a paradox in allowing the decision to be made only by voters registered to vote in Scotland. But I’m afraid it’s inescapable. If the whole UK electorate were to be allowed to vote on Scottish independence, there would be a real risk that the outcome would be that the Scots would vote for independence and the rest of the UK against it — or even more embarrassingly, vice versa! Such an outcome would raise the question whether the Scots should be denied independence by the votes of the rest of the UK, and in that event, whether the UK government would be justified or even obliged to use force if necessary to prevent a Scottish unilateral declarationn of independence. Such a scenario is, or should be, unthinkable. OTOH, I can see the case for allowing adults born in Scotland but living elsewhere in the UK to vote in the independence referendum, presumably by post or online, although the process of checking birth certificates to establish eligibility would be expensive and time-consuming; and what about people of Scottish birth living in France, the US or indeed Tierra del Fuego or Timbuktu? All one can reasonably say on that, surely, is that this is to be a Scottish referendum, made in Scotland, and the place where decisions on such detailed questions must be made can only really be the Scottish parliament — which in practice presumably means by Mr Salmond, as long as the SNP continues to enjoy an overall majority there and remains united behind wee Alex. I do of course agree that all the evidence at present suggests gradually dwindling support in Scotland for independence — and the serious doubts now raised about the automaticity of an independent Scotland ‘remaining’ a member of the EU must surely intensify that downward trend. But if a week is a long time in politics, two years is 104 times longer, and the capacity of an already unpopular and hamfisted government at Westminster, rapidly running out of the control of a flustered David Cameron and a bewildered Nick Clegg, for committing at some point in those 104 weeks such a monumental blunder as to alienate and antagonise every last loyalist Scot, can scarcely be over-stated. I don’t think the implied syllogism in your otherwise pleasing bon mot about Salmond’s lose-lose situation holds water. It plainly doesn’t follow that “If Scotland is perceived in 2015 to be, absolutely or relative to the UK, doing well, then clearly the status quo is satisfactory”: some Scots at least will argue, and produce facts and figures in their support, that an independent Scotland would do even better. Even the second part of your bon mot fails: even if “Scotland is perceived in 2015 to be, absolutely or relative to the UK, doing badly”, it doesn’t follow that “this must be the fault of the SNP government”: Mr Salmond will produce exhaustive evidence that on the contrary it’s the fault of the UK government in London, and that the remedy must be to liberate Scotland from that government’s malign grip. On your final point, however, we are absolutely at one. Our constitution, with asymmetrical devolution half-baked and unfinished, a restless Scotland and an increasingly restless undevolved England, no answer in sight to the West Lothian Question, relations with the EU in flux and mired in bitter controversy, inspiring leadership from left or right long Absent WithOut Leave, and the UK political parties’ visions of the future obscured in impenetrable fog, there’s a pressing need here and now for a concerted effort by all the principal political parties to initiate a UK-wide constitutional convention with representation not only for the parties but also for all the main elements of civil society, on the lines of the Scottish Convention which produced a consensus in Scotland for devolution. A UK Convention would be empowered to commission extensive research into the possible solutions to our many constitutional problems, including detailed research into the solutions worked out and operating in other comparable democracies (especially Australia and the US). It would be tasked to produce an interim report four months before the Scottish independence referendum in autumn 2014, outlining preliminary options in the event of Scotland voting to remain in the UK, and summarising some of the consequences for both Scotland and the RUK (rest of the UK) if Scotland were to become independent. Neither the Convention’s interim report nor its eventual full report should be required to be unanimous: wherever significant differences arose, these should be faithfully recorded in all the Convention’s reports at each stage. The starting-point for the Convention’s work should be the Scottish LibDems’ paper on a federal future for the UK and the place in it for Scottish home rule. Alas, a proposal on such a scale is way beyond the imaginations of our political leaders; and even if their imaginations could grasp it, it’s hard to see any one of them having the political courage to act on it. (1)You say: “I can see the case for allowing adults born in Scotland but living elsewhere in the UK to vote in the independence referendum, presumably by post or online, although the process of checking birth certificates to establish eligibility would be expensive and time-consuming.” The logical reverse of that coin is, however, debarring persons on the electoral roll in Scotland from voting in the referendum if born outside Scotland – not only those born outside Scotland of parents Scottish by birth, but also persons like the Polish servicemen and italian POWs who married local lassies and settled in Scotland after the war (not to mention myself, born of English parents but resident in Sctland since 1963). Well, isn’t the argument symmetrical? (2) If instead of one question on the ballot – Scottish independence, yes or no? – there are three – Scottish independence, devo max (to be defined!) or the status quo; I can the the voting going say 35, 40, and 25%. Then the most popular option of those choosing to vote will represent a minority opinion, but wil inevitably be used by its politician advocates to indicate an electoral mandate. This strikes me as ugly. Cn you give any contra-indicatory instances from countries (Australia?) where ballots often contain several options? Brian writes: Thank you for these comments, Tim. On your (1), I don’t see any reason to apply a “born in Scotland” qualification for Scots living elsewhere in reverse by disqualifying those currently on the Scottish voters’ register but not born in Scotland. It would be impossibly cumbersome to abandon the current (residential) qualifications for voting in Scotland and substituting a birthplace qualification, which would mean tearing up the existing registers and drawing up new ones involving production of birth certificates. The obvious course must be to use the existing rolls, including voters resident in Scotland but not necessarily born there. If it were to be decided that Scots living outside Scotland should also be allowed to vote, a residential qualification would obviously be impossible and the obvious way to establish Scottishness would be by reference to birthplace. On your second point, it would be easy to avoid the ambiguous outcome of a three-question referendum that you envisage, either by using the single transferable vote procedure or, perhaps more simply, by using the formula suggested in my response to the comment at http://www.barder.com/3804/comment-page-1#comment-157546. I think Scotland should look at their inner weaknesses first before proceeding for this otherwise it is a one way to failure. Be sure, accurate and non hypocrit. I have few examples of where Scotland is hardly resolving its problems. this is also in workplaces. Raise a person to raise your country, do not look at what a person is or how he is. Look at what other countries are doing. your few neighbours for that matter and follow that example.